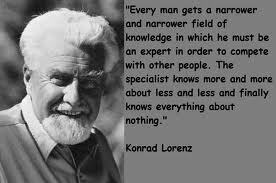 Konrad Lorenz was born on November 7, 1903, in Vienna, Austria, as the younger of two sons born to Adolf Lorenz and his wife and assistant, Emma Lecher. Lorenz's love of animals began outside of school, primarily at the family's summer home in Altenberg, Austria, and his interests became more grounded in science when he read about Charles Darwin's evolutionary theory at the age of 10. In 1922, Lorenz began premedical training at Columbia University in New York but returned early to Austria to continue the program at the University ofVienna. Despite his medical studies, Lorenz found time to informally study animals. He also kept a detailed diary of the activities of his pet bird Jock,a jackdaw. In 1927, his career as an animal behaviorist was launched when anornithological journal printed his jackdaw diary. During the following year,he received an M.D. degree from the University of Vienna and became an assistant to a professor at the anatomical institute there. His interests led himto study zoology at the University of Vienna, and in 1933, Lorenz earned hisPh.D. in that field. Lorenz developed the theories for which he is best known during the years 1935 to 1938. He spent what he called his "goose summers" at the Altenberg home,concentrating on the behavior of greylag geese and confirming many hypotheses that he had formed while observing his pet birds. While working with the geese, Lorenz developed the concept of imprinting. Imprinting occurs in many species, most noticeably in geese and ducks, when--within a short, geneticallyset time frame--an animal will accept a foster mother in the place of its biological mother, even if that foster mother is a different species. In addition, he and Nikolaas Tinbergen, future Nobel Prize cowinner, developed the concept of the innate releasing mechanism. Lorenz found that animals have instinctive behavior patterns, or fixed-action patterns, that remain dormant until a specific event triggers the animal to exhibit this behavior for the first time. The fixed-action pattern is a specific, ordered series of behaviors, such as the fighting and surrender postures used by many animals. He emphasized that these fixed-action patterns are not learned but are geneticallyprogrammed. The stimulus is called the "releaser," and the nervous system structure that responds to the stimulus and prompts the instinctive behavior isthe innate releasing mechanism. Lorenz later devised a hydraulic model to explain an animal's motivation to perform fixed-action patterns. While the research continued, Lorenz accepted an appointment in 1937 as lecturer in comparative anatomy and animal psychology at the University of Vienna.In 1940, he became professor of psychology at the University of Konigsberg in Germany but a year later answered the call to serve in the German Army. In1944, Lorenz was captured by the Russians and sent to a prison camp. It was not until 1948 that he was released. Upon his return, Lorenz went back to theUniversity of Vienna before accepting a small stipend from the Max Planck Society for the Advancement of Science to resume his studies at Altenberg. By 1952, Lorenz had published a popular book King Solomon's Ring, an account of animal behavior presented in easily understood terminology. Included inthe book are many of his often-humorous experiences with his study subjects.The book also includes a collection of his illustrations. In 1955, with the increased support of the Max Planck Society, Lorenz, ethologist Gustav Kramer, and physiologist Erich von Holst established and then codirected the Institute for Behavioral Physiology in Seewiesen, Bavaria, near Munich. During the ensuing years at Seewiesen, Lorenz again drew attention, this time for the analogies he drew between human and animal behavior--which many scientists felt were improper--and his continuing work on instinct. Following the deaths of codirectors von Holst and Kramer, Lorenz became the sole director of the Seewiesen Institute in 1961. In 1966, Lorenz again faced some controversy with his book On Aggression, an example of his shift from solely studying animal behavior to including human social behavior. In the book, Lorenz describes aggression as "the fighting instinct in beast and man which is directed against members of same species." He writes that this instinct aids the survival of both the individualand the species, in the latter case by giving the stronger males the better mating opportunities and territories. The book goes on to state that animals will use rank, territory, or evolved instinctual behavior patterns to avoid actual violence and fatalities. Lorenz says only humans purposefully kill eachother--a fact that he attributes to the development of artificial weapons outpacing the human evolution of killing inhibitions. In 1973, Lorenz, Tinbergen, and Karl Frisch, who studied bee communication, jointly accepted the Nobel Prize for their behavioral research. In the same year, Lorenz retired from his position as director of the Seewiesen institute.He then returned to Altenberg where he continued writing and began directingthe department of animal sociology at the Austrian Academy of Science. In addition, the Max Planck Society for the Promotion of Science set up a researchstation for him at his ancestral home in Altenberg. In 1927, the same year his career-launching diary was published, Lorenz married childhood friend Margarethe "Gretl" Gebhardt, a gynecologist. They had twodaughters, Agnes and Dagmar, and a son, Thomas. Lorenz died February 27, 1989, of kidney failure at his home in Altenburg, Austria, at age 85.